If you have been watching The Bachelor this season – which has been fantastic, by the way – you know Chris has a funny way with words. His blog for People Magazine only serves to supplement the broadcast show, and in writing. I was proud to show her my land. That pooch taught me some moves I didn’t even know existed. I sucked, once again, but I thought it was something she’d enjoy. When Whitney and her boss took me into the room “where the magic happens,” I really thought for a moment that she was going to have me prove that my soldiers could march. P.S. Jade’s resemblance to Jennifer Peros of US Weekly freaks me out. 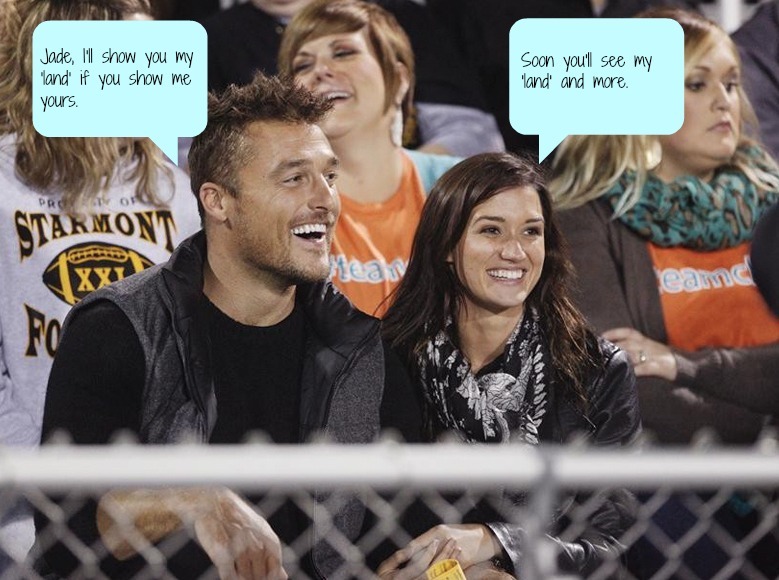 This entry was posted in Guilty Pleasures, Snark and tagged abc, Bachelor Nation, Chris Soules, Jennifer Peros, People Magazine, The Bachelor, US Weekly on February 23, 2015 by onechicklette. This really has been a good season. I feel like there is a good chance he is going to propose to Whitney…which I am not a fan of because I can’t stand her voice, mostly. I did like her sister, though! I love Carly’s commentary, that girl is hilarious!